Adjustable heel pad for easy fit. Brace height adjusts to range of 5" - 6.5"
My daughter has a sprained ankle and was given an air cast at urgent care. Her leg is wide so the straps do not go all the way around. Do you have an air cast for wider legs or strap extensions? You may order the extended straps through DJO Global 800.336.6569 they will charge an extra fee to make a custom strap to help her fit into the brace. The Aircast Air-Stirrup Light fit should be supportive, snug but not tight and restricting. 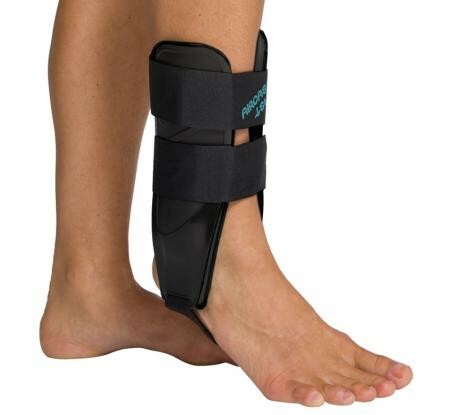 What is the main difference between this brace and the aircast sport stirrup? I tend to sprain my ankle frequently and was looking for a comfortable brace to wear with shoes that won't stretch out the shoe too much. Other than the color the Light is Universal for both left and right ankles and the hieght of the brace only goes up to 6.5"
I was given a black "Aircast Air-stirrup Universe Ankle Brace 02E" at the doctor's office for a swollen ankle. Is there a right and left for this model or are they interchangeable? My left ankle is hurt and from looking at your videos it seems I might have a right side brace. There is no "foot" at the bottom of my brace to help as a guide to which foot the brace is for. Should I be able to flex my foot in this? I recently purchased this and am unsure whether or not I should be able to move it. Thank you for your question. You will be able to flex/extend your ankle with this product. The AirCast Air-Stirrup Light is designed to give stability to the ankle to keep in from "rolling". I was given this item when i was brought to the trauma room at our hospital. my problem is they didnt show how to inflate it. could you please instruct me on this.I appreciate any info that you can give me. The Air Stirrup is not recommended for activity. You should look at the AirCast AirSport, the Velocity or the DonJoy Stabilizing Ankle brace. I am using this stirrup and the heel strap is starting to tear. Can I get a replacement? If you obtained this Aircast Air-Stirrup Light from us, please email us @ service@betterbraces.com with your order number. If not, you'll need to contact the location from where you made the purchase. Is this suitable for either foot?and are there aircells in this model like the regular stirrup model---I have had good results with the regular model--but the darker color appealed to me . This item is universal left or right. Are the sides of the light model made of the same plastic as the regular air cast? The Aircast Air-Stirrup Light is made with the same semi-rigid material as the Aircast Air-Stirrup. The difference is that the Air-Stirrup Light shell is not contoured at the ankle bones like the Air-Stirrup and the Light has padding under the shells instead of the patented duplex air cells of the Air-Stirrup. Yes. The Aircast Air Stirrup Lite will fit into most athletic shoes.